Ziplining had already been on our hitlist for a couple of years. 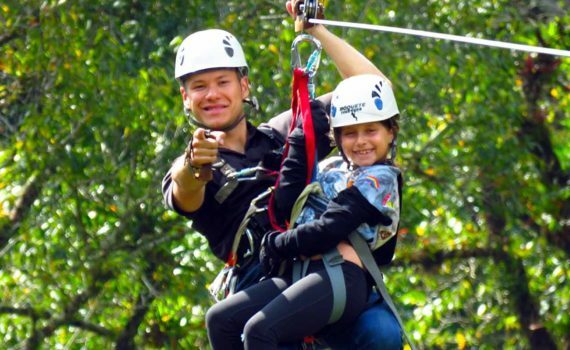 When planning our trip to Panama, we discovered that the Boquete TreeTrek Mountain Resort operate one of the largest and most popular ziplining experience in Latin America, so what better place to start than ziplining in Boquete Panama? 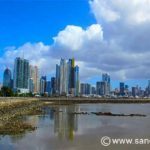 Our tour was organized from a small office near the bank just off the High Street in the centre of Boquete town. After signing up, and completing the obligatory indemnity forms, we were given our orange wristbands. We then headed off in a large bus with a crowd of tourists sporting a variety of multi-colored wristbands. 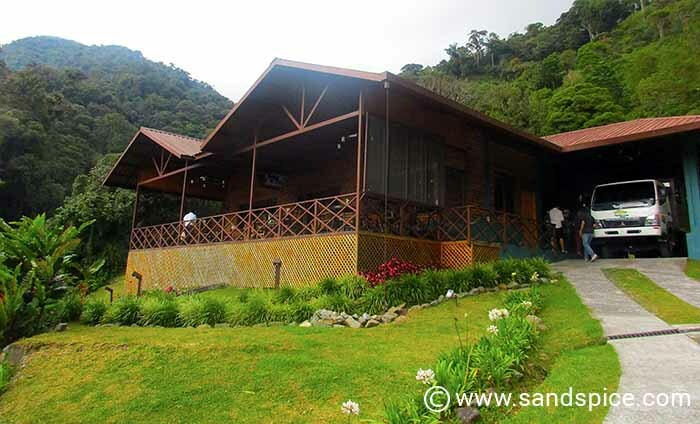 It took around half-an-hour of driving up increasingly steep inclines before we reached the Boquete TreeTrek Mountain Resort base camp. Our instructors, all kitted-out like ninjas in their cool black uniforms and harnesses, were waiting for us. At this point, we were segregated by colour code. 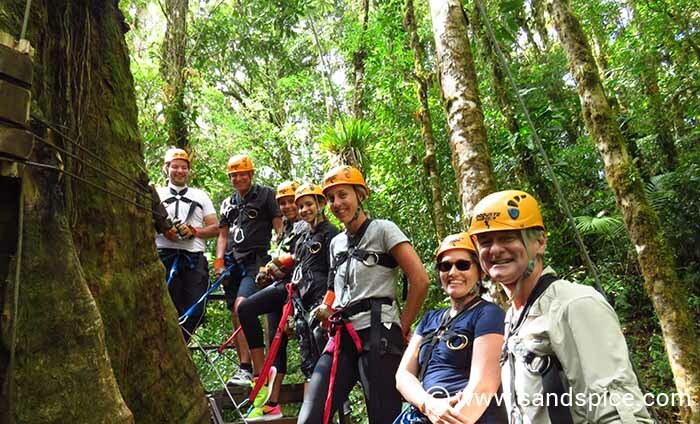 There were various activities on offer: a Hanging Bridges tour, a Bird Watching tour, and the Canopy Ziplining tour. All orange wristbands were routed through to the instruction area. There were padlocked lockers available nearby for storing valuables. It’s also a good idea at this point to stop drinking and take a pee: There’ll be no chance later when you are all harnessed up. 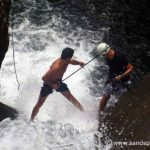 ♦ DON’T grab the zipline in front of you if you want to keep your fingers. ♦ DON’T break unless told, otherwise you won’t reach the next station. ♦ DON’T lower your legs or you’ll lose balance. ♦ DON’T worry. No one lives forever. Instructions were in both Spanish and English, but our guides seemed to speak a little of most languages, including Russian. 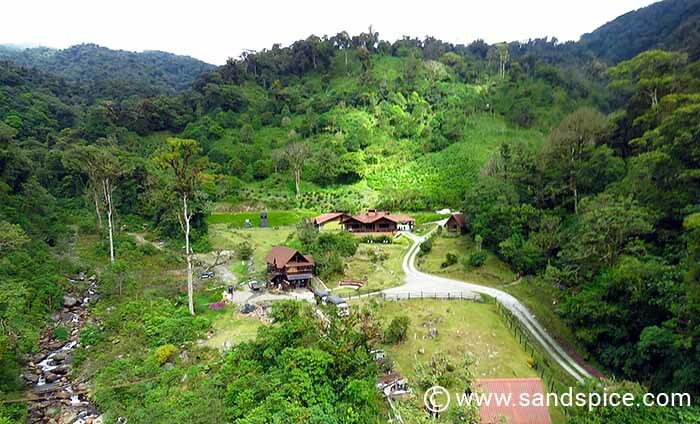 They then escorted us to the first zipline station, located on the side of the hilltop. We were a mixed group of around 20. 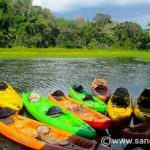 All ages and nationalities, including some kids no more than 9 or 10 years old. These young kids went first, each securely strapped to an instructor. Then it was our turn to go: Solo trips only for the apprehensive adults. 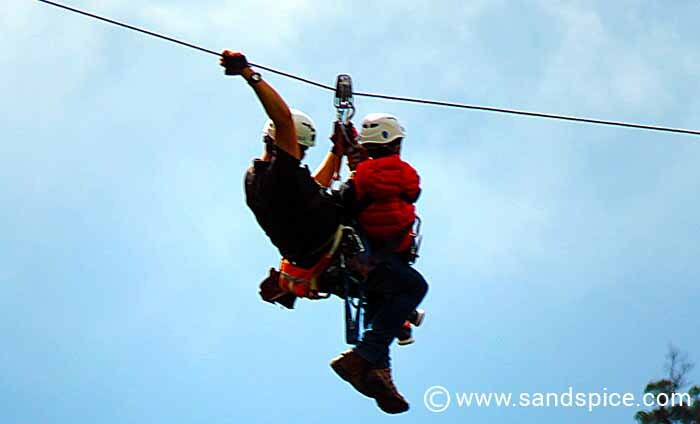 To latch onto the zip cable, we needed to jump up while the instructor deftly clipped us onto the line. 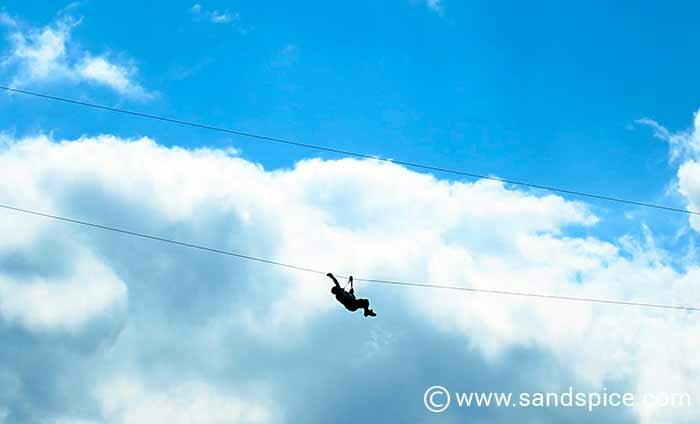 Grab the back of the zipline with a protective glove, swing up your legs, lean back… and off you go! The first run was a short 150 meters. We needed to break just before the end, but just in case all the ziplines had a failsafe breaking mechanism. A lot like a carrier landing, another cable automatically engages just before the end to pull back and soften the landing. The first small metal platform I reached was attached to the top of a really high tree. Here, a second instructor was waiting. There would be no time to take a breather, let alone wimp out. As soon as I landed on the platform he unclipped me from the line. He then immediately attached me to the 2nd zipline. With just a few seconds turnaround and a friendly word of reassurance I was pushed off onto the 2nd line. 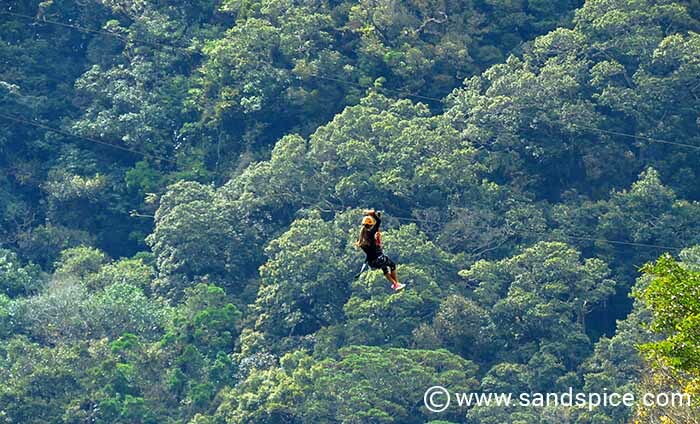 This time I was travelling 80 km per hour perpendicularly to the first zipline. Arriving high in the treetops at the third station, I was quickly detached, attached to another line and sent off again. This time I was instructed not to hold the back of the zipline. The result of this strategy was to send me to the next station spinning like a top. It was only after we all reached the third station that we stopped for a breather. Since this was the only tree-station with a way down to the ground, it was the first (and last) opportunity to end the madness – or fun, depending on your perspective. By this time, most people seemed to have gotten over their initial fear. There was a lot of multi-national chatter and joking. We were all beginning to enjoy the experience. No-one was prepared to throw in the towel. 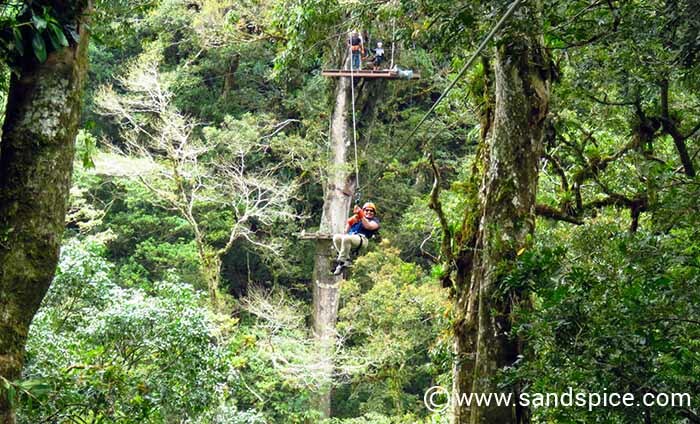 Over the next 45 minutes there followed another 9 zipline runs from treetop to treetop. At all interchanges we were impressed by the enthusiasm, friendliness and professionalism of the instructors. The best 3 runs were saved to the last. 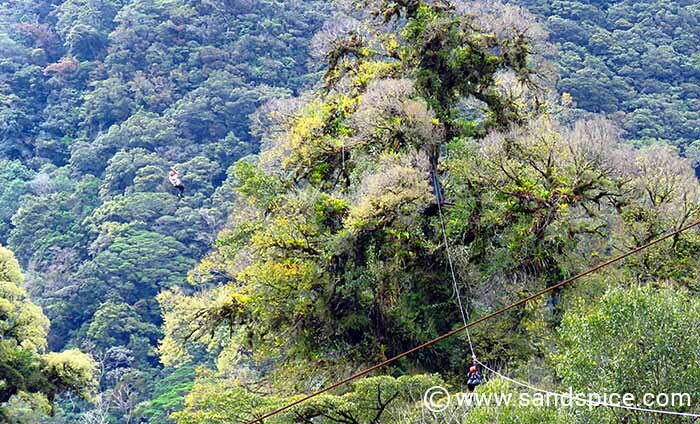 Three really long ziplines spanning the open area high above the river and main buildings: No breaking advised. In total, we had made 12 zipline runs. After removing our gear we were treated to a short video compilation of photos and movies taken that afternoon by the instructors. These were available to purchase on pen drives for $15. 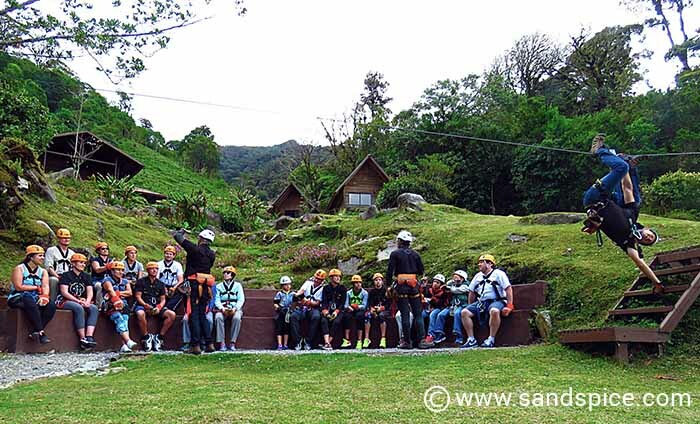 Our ziplining day out, including transport, came to $65 per person, leaving us all very hungry for more.